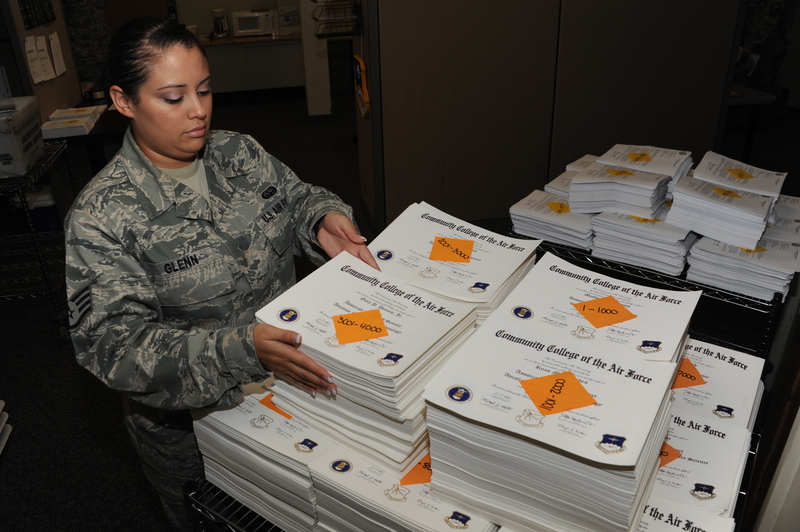 The Community College of the Air Force has hit a milestone. CCAF graduated its largest class to date, according to an Air Education and Training Command release. CCAF graduated 23,160 members in 2014 with the help of the October class: 13,042 members earned their Associate of Applied Science degrees this month. That’s a bump from last year — the college graduated 20,271 members in fiscal 2013, Michael Ritz, spokesman for the 42nd Air Base Wing Public Affairs, Maxwell Air Force Base, Alabama, told Air Force Times. But graduating students in the thousands every year comes as no surprise, writes Airman 1st Class Alexa Culbert: CCAF is the largest community college in the nation with a 6,000-person staff, 2,000 courses and more than a quarter million students, all distributed within 108 affiliated schools. Founded in 1972, the college began issuing degrees in 1977, and was granted accreditation from the Commission on Colleges in 1980; CCAF now shares Air University’s accreditation, CCAF commandant Lt. Col. Michael Artelli said in the release. Congrats to this year’s graduates!